Growing fresh veggies, fruit, herbs, and beautiful flowers is not limited to those who have acres of land. The answer to small space gardening is to install a raised bed. Raised bed gardening is not only perfect for those with limited space, but is also an excellent option if you battle with poor soil. These garden sites are attractive, easy to maintain, and produce high yields. Plants have less problems with disease, pests, and weeds because you can control the soil quality in a raised bed. 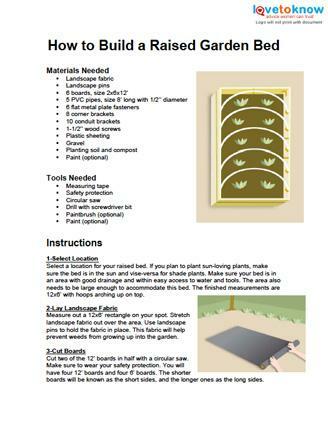 Follow these easy to understand instructions to create a feasible and practical raised bed garden. If you need help downloading the printable instructions, check out these helpful tips. Select a location for your raised bed. If you plan to plant sun-loving plants, make sure the bed is in the sun and vise-versa for shade plants. Make sure your bed is in an area with good drainage and within easy access to water and tools. The area also needs to be large enough to accommodate this bed. The finished measurements are 12x6' with hoops arching up on top. Measure out a 12x6' rectangle on your spot. Stretch landscape fabric out over the area. Use landscape pins to hold the fabric in place. This fabric will help prevent weeds from growing up into the garden. Cut two of the 12' boards in half with a circular saw. Make sure to wear your safety protection. You will have four 12' boards and four 6' boards. The shorter boards will be known as the short sides, and the longer ones as the long sides. Arrange two of the long boards and two of the short boards in a rectangle on their sides. Use a corner bracket and screws in each corner of the rectangle to connect the pieces. Repeat with the remaining four boards. Place the two rectangles on top of each other over the landscape fabric. Make sure the two rectangles line up perfectly. Use flat metal plate fasteners and screws to attach them together. Place one fastener on the center of the end boards and two, evenly spaced, near the center of the long boards. Screw five metal conduit brackets into the inside of the top long board on each side. Make each bracket evenly spaced and about 1-inch from the top of the raised bed. Stick one end of the first PVC pipe into one of the metal conduit bracket. Bend the piece over the bed and insert the other end in the opposite side's bracket. Repeat with each pipe to make hoops over the bed. Add a thin layer of gravel to the bottom of the raised bed. This will help with drainage if the bed is too full of water. Fill the rest of the bed up with good soil and compost. Leave a little space at the top to add mulch to later on. 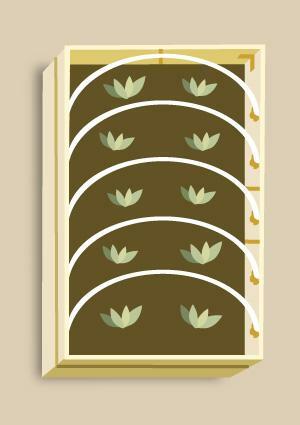 Follow the planting instructions that come with your chosen plants or seeds. Cover the raised bed by draping plastic over the hoops. Hold the corners of the plastic down with bricks or stones. If desired, the outside of the raised bed can be painted. This will give the bed a more attractive look and protect it from weather. There are numerous ways to plant in a raised bed. Choosing the best one depends on what you are growing and the desired effect. A popular layout for growing vegetables involves dividing the bed into one-foot sections and planting within each section. This keeps the bed organized and neat.